Yes you should be active on Twitter and some people find it a great source of visitors to their blog or website. A post on Twitter can drive traffic to you and so it should be high on your list of things to do once a post is published. Tweet your post and let people know that there is something new and exciting they should read on your website. It sounds simple, but there are pitfalls to watch out for and you need to understand how Twitter works. There is a search box at the top of the Twitter home page and people could be searching for information that is in your tweets. If you are promoting your business, site, service, or latest blog post, make sure that the tweet contains words or phrases that people might search for. Why is it bad? Because there is nothing in there that people might search for. The words and phrases are too general. I don’t know how many people search Twitter for “apple pie recipe” or “best apple pie”, but you can bet your tweet will be among the search results if they do! As you can see in the screenshot above, when you search, the results contain not just tweets, but Twitter accounts that contain the word in the name. If possible, choose a name that contains keywords that people search for. Search is one way that will put your posts in front of eyeballs, but you must make your tweets searchable by including relevant words and phrases. Once people find your tweet through searching Twitter, they might share it on their own account and this means that not only your followers see the tweet, but their followers too. There is a chance that it could go viral and be shared by thousands of people on the social network and elsewhere. Simply posting something on Twitter will get it seen by people searching, but in addition to search, your tweets appear in the home feed of your followers. It is therefore important to grow the number of people that follow you so that your posts appear on their home feed. @bob the information you want is here: www…. Only Bob will see this tweet because you addressed it directly to him by putting his name first. If any of your followers also follow Bob, they will see it too, but generally, few people see directly addressed tweets. Bob and all of your followers will see this tweet and so it maximises the number of people that will see it. Starting a tweet with a username is like a private message, but put any text in front of it, even a single character, makes it public. Do not start a tweet with a username unless you want to make it private. If a hash character (#) is placed in front of a word, it becomes a hashtag. Spaces are not allowed, which is why you see hashtags like #applepie instead of #apple pie. You have to run the words together. Why would you want to use a hashtag? Because it helps people search for information. Suppose you want to find tweets about vegan meals. You could search Twitter by typing ‘vegan meals’ into the search box. This will produce a list of people and tweets who have either vegan or meal in the tweet or profile. You get a lot of results and some are not what you want. 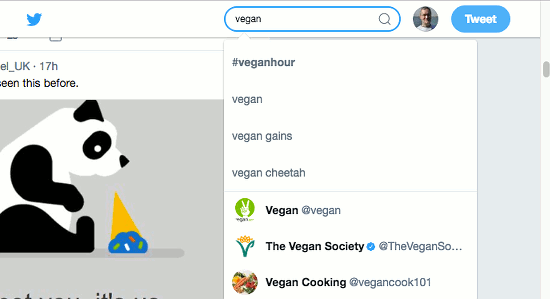 If you search for the hashtag #veganmeal then only tweets that contain this hashtag are in the search results. It acts like a filter that enables you to find exactly what you are looking for. People that are familiar with Twitter will therefore search using hashtags because the results are better. Hashtags are also clickable links and when clicked you get a long list of tweets that include the hashtag. Add a hash to any word (join words together if you need to) that you think people might search for. You could try a few searches yourself with different hashtags to see what results are displayed. You can then decide which hashtags you want to appear in your own tweet. Hashtags help people to find your tweets and then they might click through to your website if there is a link, or follow you if they like tweets of this type. Twitter is a fast paced social network and when you follow many people, and some people follow thousands of accounts, there are many tweets in your home feed. New tweets are added to the top and tweets that are just minutes old can be pushed off the bottom of the screen. This means that there is a lot of competition for screen space. Not all tweets from all followers are shown and old tweets are less likely to appear than new ones. 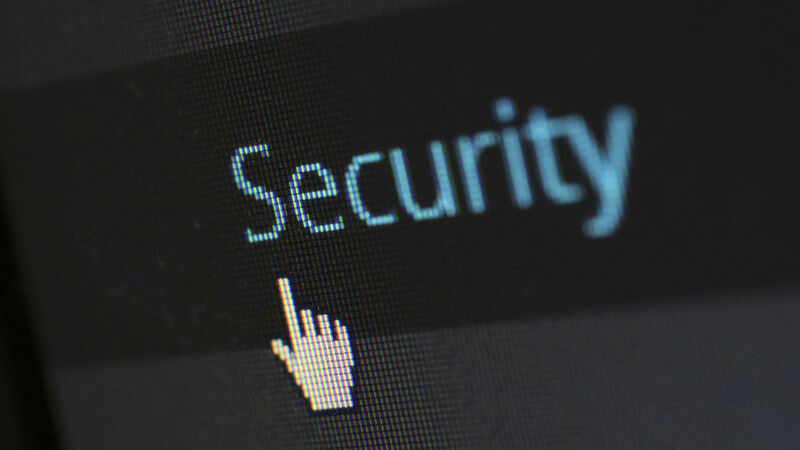 If you post a tweet in the morning, it might not be seen by someone that accesses Twitter in the afternoon. Grow your followers so your tweets can appear in more people’s feeds and rely less on people finding them through search. How can you do that? The last item, follow other people, is a technique you can employ to increase your Twitter followers. It isn’t a very efficient one and it is time consuming, but it does work. Basically you just follow everyone you find in your subject area. Search every day, use different search terms, find more and more people to follow. When you follow someone, they feel obligated to follow you back. Not everyone will, but for every 10 people you follow, 3 or 4 may follow back. Follow a hundred people and you will grow your Twitter followers by 30 or 40. Follow a thousand and you’ll get 3 to 400 followers. It is not something you can do in one go, but if you spend 15 minutes each day following people, your own followers will steadily increase. The more followers you have, the more people will see your tweets and this can potentially bring more visitors to your website or blog. Is there a downside to this? It makes your stats look bad. You end up following thousands of people, yet only a fraction of this number follow you back. It’s not a serious problem and it might be worth it to gain followers fast. You can always remove followers later. With all social networks, there are benefits from sharing other people’s content and not just your own. Just as when you follow someone they feel they must pay you back by following you, if you share other people’s content they might in turn share yours. In addition to this, followers don’t like you sharing all your own links. It looks spammy if you post link after link to your own site, service, blog or posts. Show you care about your subject by posting anything that is related to it, interesting or newsworthy. People will follow you if you post interesting tweets. 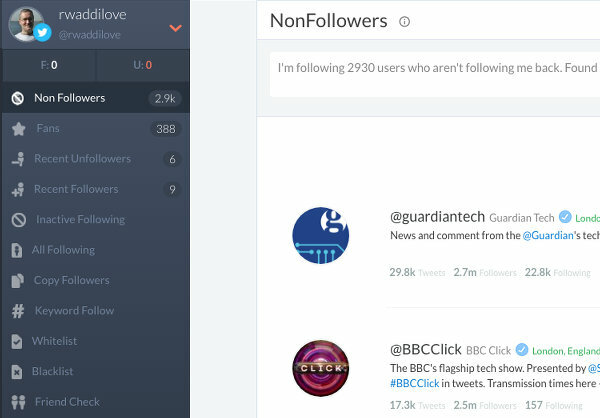 Crowdfire is a free web service that enables you to analyse your Twitter followers in various ways and is useful for managing them. See who your fans are, delete inactive people and more! 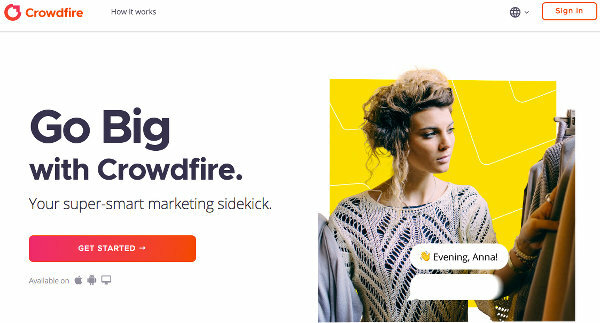 There are five different Crowdfire plans and the cheapest, which is fine for occasional use, is free. For the following guide I will be using a free account. There are some limitations, but there are still some great features that you can use for free. 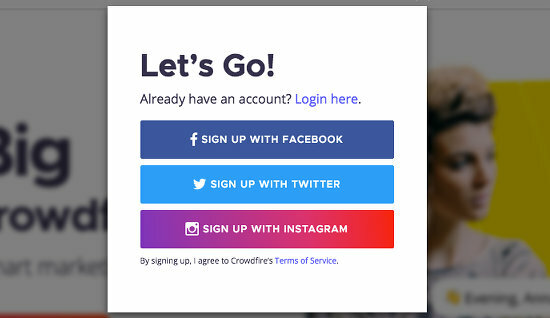 Go to the Crowdfire website and click the Get Started button if it is your first visit, or click Sign In in the top right corner if you have been before. This service is for analysing your Twitter followers, so at some point you are going to need to authorise access to your account. Might as well do it now, so click Sign Up With Twitter or Sign In with Twitter if you are returning. Crowdfire is very easy to use and you just click the menus in the sidebar on the left. At the top is Non-Followers. These are people that you follow, but who don’t follow you back. That’s mean of them! There are sometimes good reasons for this and you can follow Bill Gates, Apple, newspapers, TV companies, celebrities and so on, but they aren’t going to follow you back. You may want to look for people that should follow you back, but don’t, such as people in similar a similar type of business, with a similar interest, tweeting about the same issues, and ask yourself why. Is it something to do with your tweets? Are they not finding them interesting? Maybe they just don’t know about you. See what they have been tweeting recently, like tweets, reply to them and share them. They might start following you back. There are menu options in the sidebar to show people that have recently followed you or unfollowed you. Twitter notifies you when people follow you of course, but if you missed the notification it can be useful to see recent followers here. Select Recent Followers and there is a list of people with buttons next to them to enable you to follow them back. It is a tiny bit easier than doing this here than on Twitter. 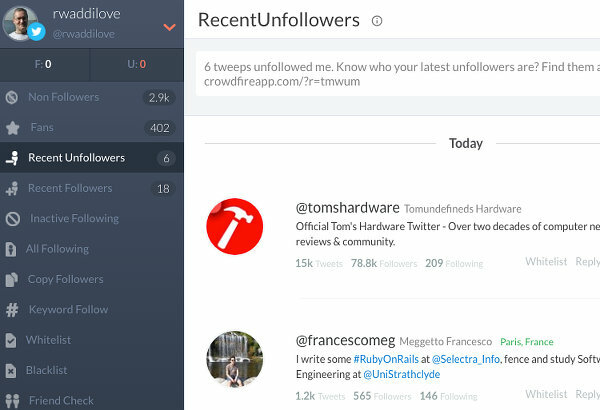 The Recent Unfollowers is interesting (it might not show up on your first visit, because it needs to gather data over time). It is said that some people will follow you for a short time and then after you have followed them back, they unfollow you. It is a cruel trick to gain more followers. You should be suspicious of accounts that have large numbers of followers, but who follow few people themselves. On the one hand there could be a good reason why they don’t follow many people, but on the other hand it may be deliberate and a trick to boost followers. Should you continue to follow people that unfollow you? Don’t just follow people that follow back, look at their tweets and keep on following if they are interesting. If their tweets aren’t what you want to see then unfollow them. Sometimes people stop using Twitter and there are any number of reasons why, but sometimes people just stop tweeting. Perhaps they just lost interest, changed their jobs, closed their business, website or app, and so on. 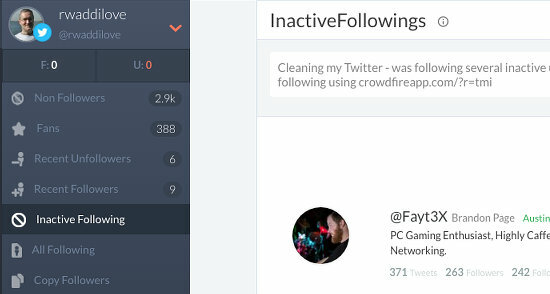 Crowdfire lets you see inactive Twitter followers. Just select Inactive Following in the sidebar and people that have not tweeted for a long time are listed. A couple of menus on the right enable you to choose the timescale and the sort order. For example, you could list Twitter accounts that have not tweeted for six months or more sorted by the oldest first. What should you do with these? Right click them and open them in a new tab to see their Twitter account. You might find people that have not posted a tweet this year. Some may not have tweeted for more than a year. Why follow accounts that do not post any tweets? Use the buttons to unfollow anyone that has not tweeted for a long time, such as more than six months. The accounts are probably dead. Sometimes there is even a message stating that the account has closed, moved and so on. Sometimes they simply stop.